Hi. Happy Wednesday. You thought it was just a normal day? Wrong. Get ready because it's this whole thing. Lemme explain. If it wasn't clear given the past few days of increasingly bizarre tweets, Kanye West has made it official: He loves President Trump. 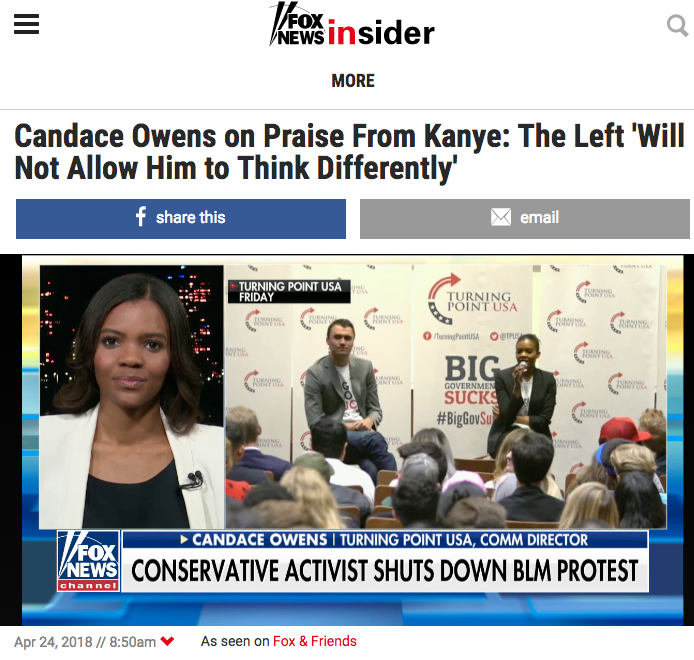 Having upset some on the left, Kanye was suddenly very popular on Fox News! 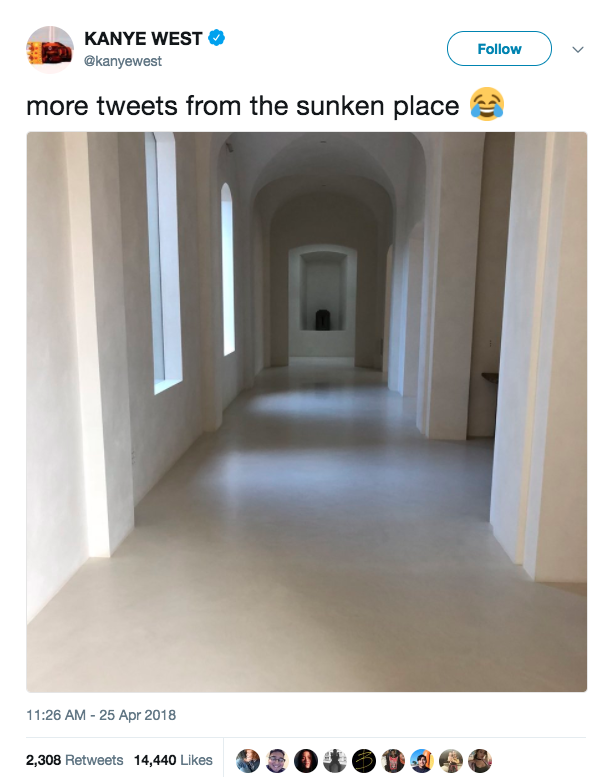 On Wednesday, Kanye began tweeting pictures from inside the home he shares with Kim Kardashian and their children, mocking the idea that he had been brainwashed and ended up in "the sunken place" from Get Out. Kim was quick to call him out on this. But then after Trump won, Kanye turned up randomly at Trump Tower during the transition to meet the then-president-elect. He then said that "the mob" can't make him not love Trump, because they "are both dragon energy." The rapper also said he loves everyone, but doesn't agree with everything anyone does. He said he doesn't tell the Hillary fans in his life (presumably including Kim) not to support her, because everyone is entitled to their own views. He also said he loves Clinton. 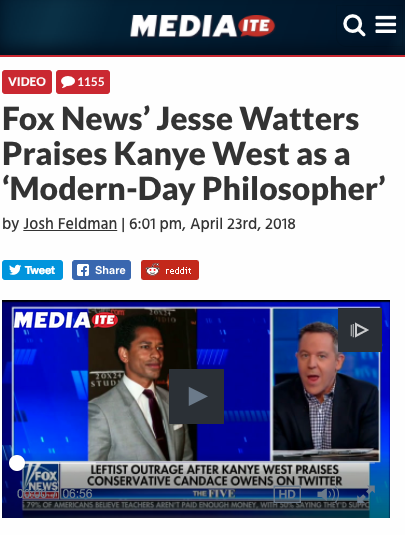 Kanye maintained he's not political and doesn't support either major party. He said he's not scared of the media, again refuting criticism he had fallen into "the sunken place." Finally, he called for more truth and love in the world. After this article was first published, Kanye then tweeted he'd received a call from Kim, who wanted him to reiterate that he doesn't agree with "everything Trump does." He also shared a photo of him wearing a MAGA hat while posing with Universal Music CEO Lucian Grainge and Lyor Cohen, the head of music at YouTube. He said the hat had been signed by Trump himself. And THEN Trump thanked Kanye on Twitter. 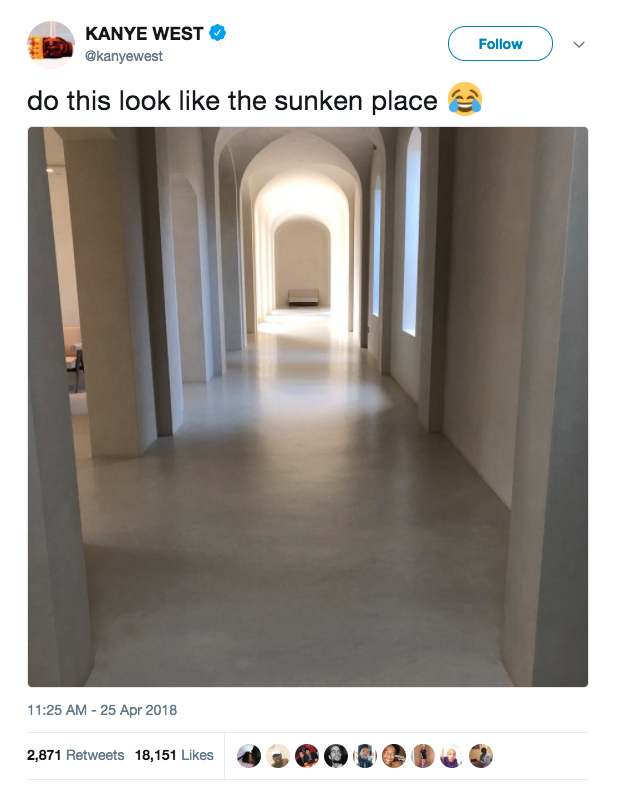 And THEEEEENNNNN Kanye shared a photo of his phone with that tweet. A tweetception, if you will. Meanwhile, Kim was out defending Kanye for loving Trump, saying that although she feels differently about the president it isn't right for some in the media to speculate about Kanye's mental health. Then, to top off all the drama, Donald Trump Jr. re-tweeted Kim's tweet with the slogan from Hillary's campaign. Trump Jr also posted Kanye's MAGA hat pic on his Instagram. "Kind of a big deal," he wrote. "Seems like a cultural turning point. Nice to see some real influencers push back on the nonsense narrative and actually push for free speech and thought and not just thought that falls totally in line with Hollywood’s and the far left’s ideology. #kanyewest #maga"
AND THEN *catches breath* Trump again quote-tweeted Kanye. WHEW. What a ride. Anyway, lots of people are talking about the Kanye/Trump love-fest, but one Get Out-inspired picture in particular is now doing the rounds. Oh, and the whole thing has Get Out director Jordan Peele very, very inspired. So, THERE you have it. What a day. May we all be made of dragon energy.